Fussy eaters can be turned into non-fussy eaters if we change our approach to food and mealtimes. 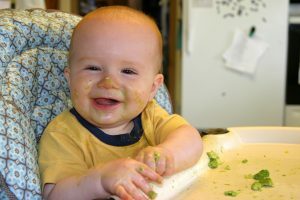 But I’ll tell you what’s even better – stopping your child becoming a fussy eater in the first place! And it really is possible. Parents so often tell me that their child became fussy somewhere between 18 months and two years old. Before that, they gobbled up everything and anything, from Avocado to Zucchini (to nick an American word). It didn’t matter what it was. Food was food – and food was good! Then the fussiness started to creep in. They refused a vegetable. Asked for a particular type of pasta. Only wanted the same thing spread on their toast every single day…. Before you knew it, you most definitely had a fussy eater on your hands! Unfortunately, we so often – with the very best of intentions – accidentally create the wrong conditions. But if we keep the conditions right, it is possible to sail through their childhood with a happy, healthy eater. That doesn’t mean there won’t be the odd food they really don’t enjoy (we all have one, two or several foods we are instinctively averse to). Neither does it mean they won’t test you when they hit the toddler stage to see what happens when they don’t eat something – BUT HOW YOU REACT TO THIS STAGE IS VITAL. So if you have a baby – your first child or perhaps the younger sibling to an older, already fussy sibling – I urge you to beg, borrow, buy or steal a copy of Getting the Little Blighters to Eat and put the approach into practice from weaning onwards. It really will make a huge difference. When it comes to fussy eating, prevention really is better – and a whole lot easier – than cure!